In my post earlier this year, regarding preliminary research into the future Duchess of Sussex’s matrilineal ancestry, I indicated that I had ordered several additional twentieth-century records that might lead to corrections or additions. Fortunately, none of the new records seriously affect the lineage I presented, but obtaining one record was not so straightforward. 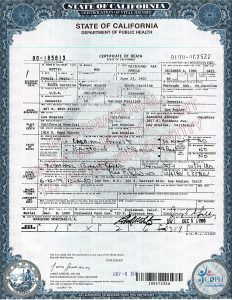 The first record I received was the death certificate of Meghan Markle’s grandmother Jeanette Johnson, which I received from the Fresno County recorder. This record stated that she died in the City of Fresno, which was her residence according to the Social Security Death Index. She was divorced at the time of her death (name of former spouse not given), with the informant being Jeanette’s son Joseph Johnson of Fresno. Her mother is listed as Nettie Arnold, and her father as unknown. The other California death certificate I ordered was for Jeanette’s mother (and Meghan’s great-grandmother) Nettie Mae Pritchard. According to the California Death Index, Nettie died in Los Angeles County on 4 December 1980. However, according to the “certificate of search” I received (above) from the Los Angeles County Registrar-Recorder/County Clerk, no such name appears in their indexes. I wrote to the State of California Department of Public Health for same exact record and received the certificate below. Clicks on images to expand them. Obviously, the record existed. Nettie died in the City of Los Angeles on 4 December 1980. While the California Death Index listed Nettie as “Nettie Mae Pritchard,” you can see the complete name listed on the death certificate is “Nettie Mae Pritchard aka Arnold.” My application to the Los Angeles County Clerk for Nettie’s death certificate provided additional information, including her full date of death, but my guess is that at the local level Nettie was indexed under Arnold instead of Pritchard. There goes my twenty-one dollars. It’s always frustrating when being told by a records repository that a record does not exist when you know it’s there. I’ve had more than one case where I have received records that are “transcriptions” stating incorrect or less than complete information. 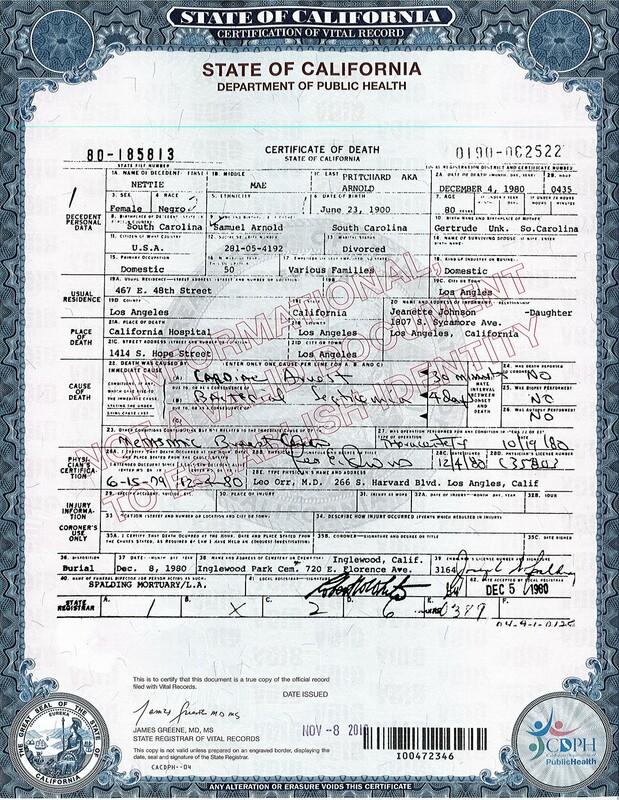 Years ago, I needed a certified copy of my grandmother’s birth record (she was born in Springfield, Massachusetts in 1914). While now I could find a digital copy of her birth on AmericanAncestors.org, at this time the record was still only kept at the city and state level. I requested the record from the Bureau of Vital Records in Boston, where an official transcribed the record from the microfilm. As I was about to leave the office, I noticed the record gave her birth as December when I knew that my grandmother was born in September! I told the official, the error was acknowledged, and I received a new (and correct) transcription. What if I didn’t spot the error and had just gone home? 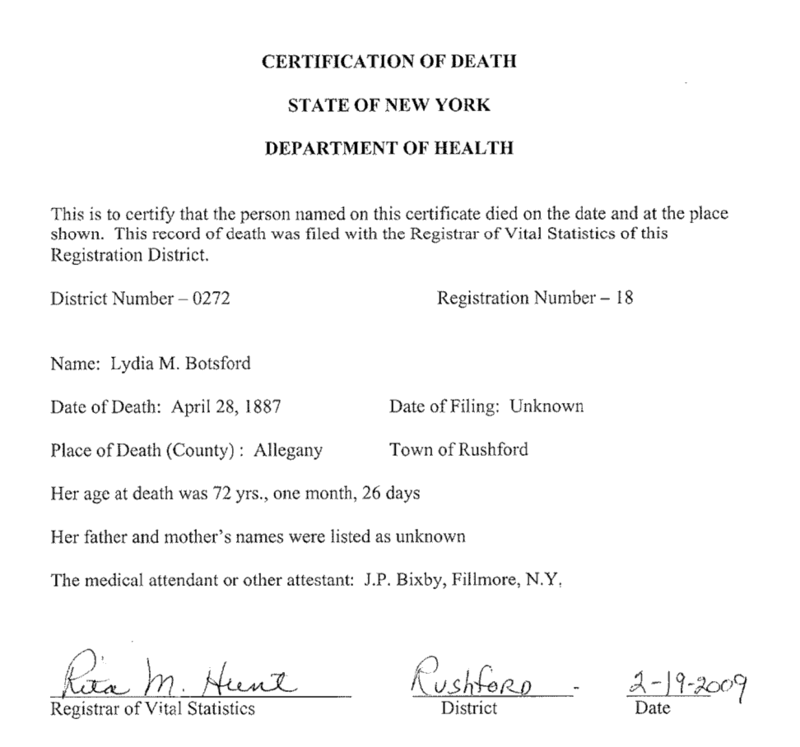 Another example was when I wrote to get a copy of the death record of my great-great-great-great-grandmother Lydia Botsford, who died in Rushford, New York in 1887. You can see the problem: the deceased is listed as Sylvia. You can see the problem: the deceased is listed as Sylvia. 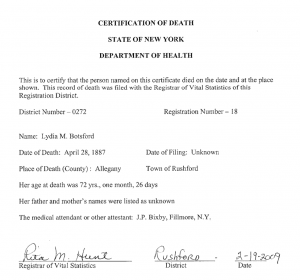 Also, while I was requesting this record by mail in 2009, I had visited the Rushford clerk’s office seven years earlier and knew the death record gave more information, including her exact age at death. After I called the clerk, I received the below “complete” transcription. Many states and localities only allow the physical viewing of recent records by the clerks themselves. This can make it tricky to prove something is wrong when you suspect an incorrect transcription or you’re told there is no record. All in all, if you think that something a keeper of records told you is incorrect, see if you can get a second opinion! My grandfather, Holland Harris McCurdy, died in 1949 with his father listed as “John McCurdy”. John was actually his youngest child who lived next door, my Uncle Jack! I’ve had issues with Los Angles County records as well, though I can’t be positive whether it’s on their end or my own. They reported that they have no record for my great-great-grandparents’ marriage, although the marriage license is viewable online through Family Search. These great-great-grandparents died in Anaheim in 1877 and Santa Ana in 1881, which were then both part of Los Angeles County, prior to the creation of Orange County a few years later. I thought I’d read that counties retain their old records, which is why it’s important to know county jurisdictions for the time period in question, but my records request came back with a note that these towns are in Orange County (now…which I obviously knew). Any tips or clarifications to share on this? 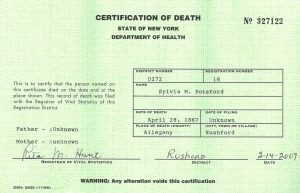 I tried both an ordinary search, then a deep search with the State of Ohio for the death record of my great grandmother Clara Cole Carothers who died in 1945. Not only did I have newspaper obituaries announcing her death, but my aunt had been at her bed side when she died. Ohio said could it not be found. Years later FamilySearch acquired a digital record of the death records for the period in question. 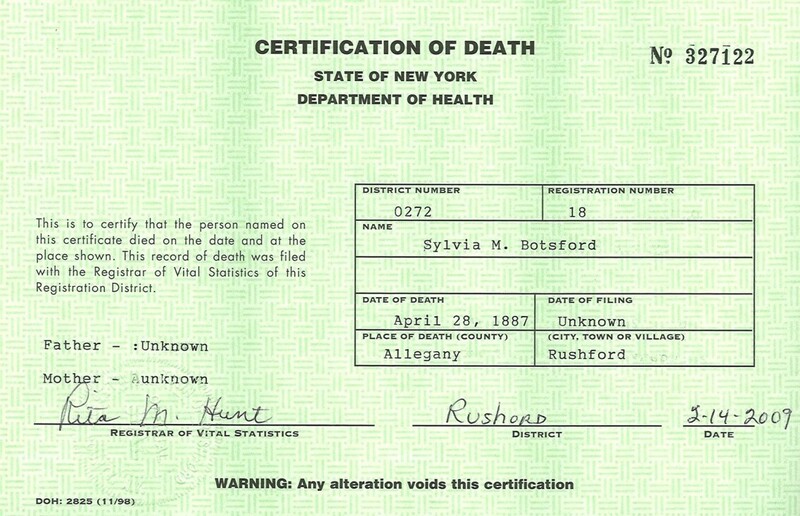 Her death record was right where it should have been, nothing misspelled about her name. I have no idea why the State of Ohio could not find it. Great article! I have run across this numerous times in my amateur pursuits. I always like to get that second opinion as you said, and consult published genealogies in addition to the official city/state records. Many of us have had this frustrating experience. It is also expensive because each search for a different name, date, county, or office, etc., is typically a separate request. And as you noted, we may have good information that a record exists, but they can’t find it! I have had this problem with state archives, too. Christopher, why don’t you get your money back by making a compelling case that the record was there and the record wasn’t searched well. I have complained to vital statistics places and I’ve got my money back when it was discovered that the record was incompetently searched. This kind of thing is very frustrating. I had a similar experience in obtaining the death record of my great-grandfather in Florida. I gave a specific date of death for him (from a military record) and was told they didn’t have it (they even issued an official statement to the effect). I made a second request and asked them to widen the search about a week in either direction … and they found it. It seems the date that the death was FILED was a different date (off by about 5 days). So they sent me that record. Well, guess what, it had no cause of death!!! (This record was from 1898, by the way). It seems you have to specifically ASK for that information to be included. One charge for record wasted on their failed search. Luckily, when I asked for cause of death to be included, they were kind enough not to charge me again. LOL. I paid $25 for a cut and paste marriage for my grandparents from the state of Iowa. It’s the ugliest thing I’ve ever seen. They didn’t even line the strips of paper up so that they were parallel to each other. Their reasoning was ” there were other records on that page” (that I didn’t pay for). If/when those marriage records ever come on line I will be able to get a clean copy. Yes. I’m done sending money to anybody. Sooner or later they will be on line somewhere. I will be able to see what it really looks like.